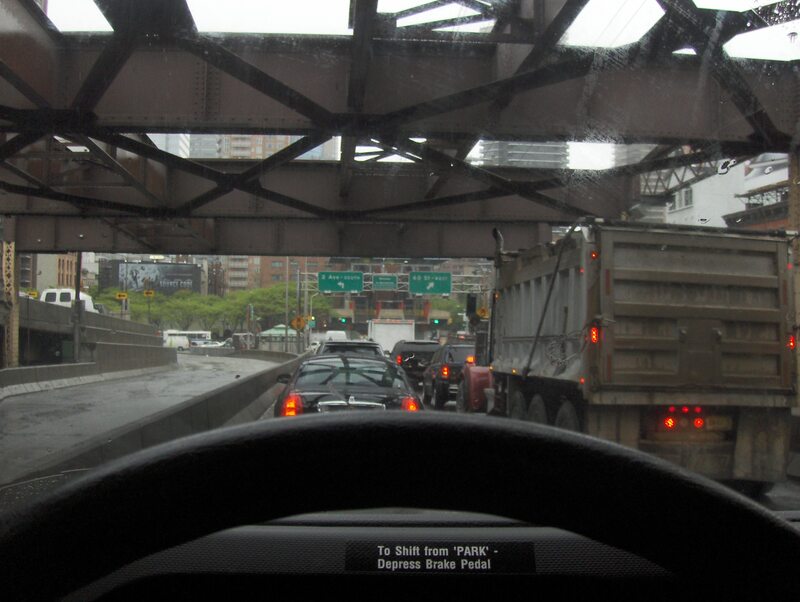 This is the nervous picture I took driving across Queens Bridge into Manhattan. My new roommate, Kier, had rented a U-Haul truck, but unfortunately, they wouldn’t let him drive it since he only has an Australian driver’s license and a Korean one. (He’s a very interesting guy!) So I agreed to drive it for him in exchange for “breakfast,” which turned out to be coffee and a pseudo Egg McMuffin from Dunkin Donuts, but I know the guy is broke so I took it very graciously. Plus driving a U-Haul in Manhattan is kind of fun. I like driving. I don’t really miss having a car and all the expenses that go along with it, but I miss driving around. I had work at 10, and we had to return the U-Haul before 9. I believe we got up at 6. Actually I got up at 6. He returned from his other apartment at 6 to meet me. He hadn’t slept in two days! Kier passed out in the seat next to me, and I happily listened to NPR while driving through the downpour.